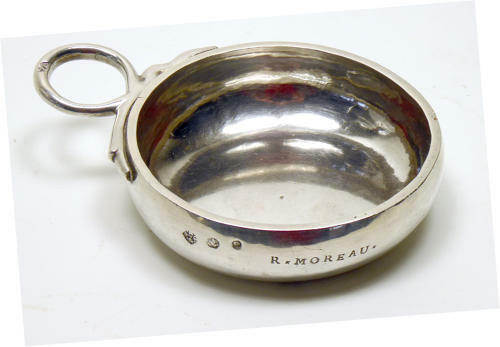 This is a typical French wine taster (tastevin), but not one of the numerous late 19th century examples,but an earlier one. The shallow bowl is plain with a caulked edge, (ie it is thicknessed by hammering around its top edge). Unlike many, it is higher grade silver and this example is stamped with the name of the original owner - R MOREAU adjacent to the marks. It has a loop (snake) handle, also marked with the maker's mark , which appears to be PN over D with a key between the P and the N(?) all within a lozenge (see second image). The bowl is 3.1", 8 cm. diameter and over the handle measures 4.3", 10.1 cm. The tastevin is in very good condition, of good gauge and with its original patination. One has to wonder if this was originally ordered by a member of the famous house of Moreau in Chablis.